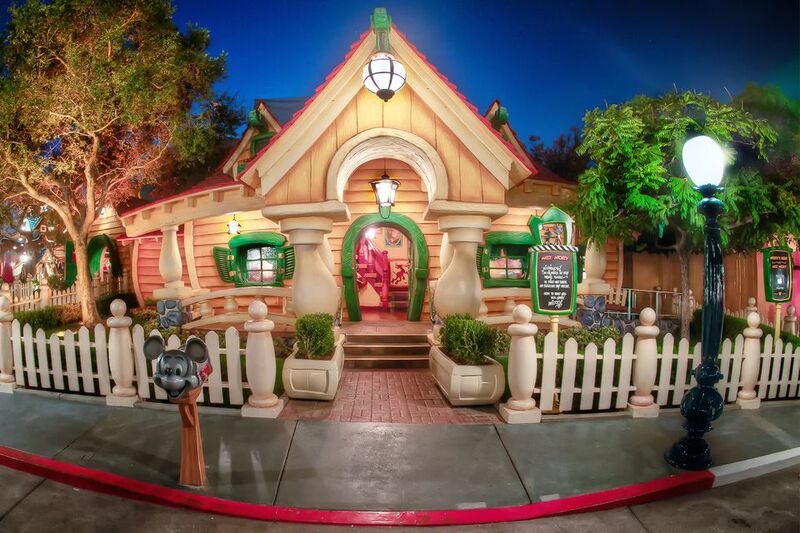 It's so cute that Mickey and Minnie Mouse built their houses next door to each other in Toontown. As far as the public knows, they have never been married. Although Walt Disney said in a 1933 interview that "in private life, Mickey is married to Minnie," they keep up their public persona by having their own places to live. Mickey's House is filled with mementos of his long career. You can walk through his living room, den, laundry room and back yard and greet him in his dressing room in the Movie Barn. Every room is full of rich details. You can watch a classic cartoon on the television, check out Mickey's collectibles which include a special photo of Mickey with his pal Walt Disney, and don't miss the oversized vegetables in the garden. We polled 166 of our readers to find out what they think about Mickey's House. 80% of them said It's a must-do or go if you have time. Wait Factor: Medium to high, 30 minutes to an hour on the busiest days. You may find shorter lines during the first couple of hours Mickey is at home, or late in the day when Toontown isn't closed for fireworks. Pay attention to the details. Check the names of the books in the bookshelf. Read the messages on his bulletin board. Check out Mickey's gloves in the washing machine, and don't miss the broomstick from the animated film "Fantasia." Also look for Pluto's dog door and notice that his radio actually works. You're guaranteed to find Mickey here, but not all day long. Check the daily schedule to see when he's receiving guests. You'll have enough time to take a couple of photos and get his autograph. Think of a fun question to ask and you might get to linger a little longer while he answers it. His birthday is November 18, so that would be a good day to say Happy Birthday. Of course, you'll see the real Mickey, but you might also spot a hidden Mickey during the holiday season. Just look toward the top of the Christmas tree. Reviewers at Yelp give Mickey's House some the highest ratings for any Disneyland attraction, saying things like "Getting a Picture of my son with Mickey=5 stars. The wait=2 stars" and "It is a must to always visit Mickey's House. C'mon, he's the big cheese around this park." You can read more of their comments here. If you're tired or walking or in a hurry, you can take the Disneyland Railroad from the main station to a stop near the Toontown entrance. Visitors enter in small groups, so if you hang back, you may get a little more time with him. A Disney photographer will be on hand, but you can also take your own photos. Mickey doesn't talk, but he communicates with kids just fine. The Movie Barn gets its name in part from the so-called barn studio where Walt Disney created some of the earliest Mickey Mouse cartoons. Cynics say the entire house is just a dressed-up queue to distract you from the sometimes long wait to meet the world's most famous mouse, but that's just fine with me. The house is fully accessible. Wheelchairs should go up the ramp on the right side of the house. More about visiting Disneyland in a wheelchair or ECV. If you'd rather walk than ride, you'll find a lot of things to do in Disneyland. In fact, you can explore ten walk -through attractions and see parts of Disneyland that many other visitors miss. And that doesn't count all the ways.